Select speakers introduce the many charms of Gifu prefecture, including a special presentation on humanitarian and Gifu native Chiune Sugihara by esteemed scholar Dr. Sylvia W. Smoller. 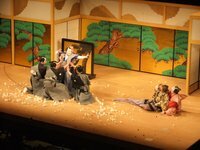 The program will also feature a special demonstration of jikabuki, a regional form of kabuki theater performed in rural parts of Japan. At the tasting reception, sample Gifu delicacies rarely found in the U.S., including premium wagyu Hida beef, which makes its U.S. debut at this event, and a variety of fine sakes brewed with Gifu’s famously pure waters.Followed by a tasting reception. japansociety . Last modified Aug 03 2016 10:53 a.m.